Many Linux users play Windows games under Wine and I know how frustrating it is when while launching or installing a game these errors pop up. Please insert Disc 1 to play the game. No disc found in the CD Drive. To take care of these errors we have to make Wine detect a disc or mount an image. Insert your disc into the drive. Let your distro read and mount the disc. Now launch Wine Configuratiion. Click on the drives tab. Click on Add button to add a new drive and label it. Go to advanced and in 'type' select CD-ROM. Click on browse and point to your disc location. Click Apply and OK. It's done. No more disc errors. There are two ways through which you can handle disc images. 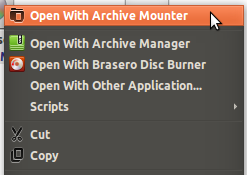 Right click your disc image and select 'Open with Archive Mounter'. It will mount your disc image as a storage drive. Create a new CD-ROM drive in Wine as explained above and point it to the newly mounted drive location. Install Furiuos Iso Mount or any application for mounting images from software center. Mount the image using the application. Again create a new cd-rom drive and point it to the location where your image is mounted. As far as the disc images are concerned either of the two methods will work. If you can't find one method working, try other. Note: No-CD cracks can also be used to take care of disk errors but they are only considered legal if you own the original copy of the game. Also you have to find one from internet.